Are you a caregiver and not sure what your spouse/parent needs? Just as each person is unique, so are the exact services they require to successfully meet their immediate or long-term care needs. During your initial consultation, we will help determine which of these services you or your loved one needs and help you become better informed regarding options and resources. By telephone or via Skype: $199.00. If meeting at your office or home is preferred, please call for prices and more information: 416-658-8887, email nadia@eldercaring.ca or complete the form below! 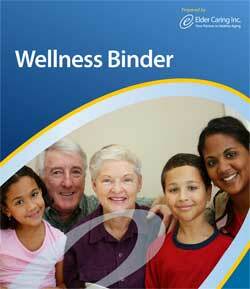 Be prepared by purchasing our Elder Caring Wellness Package: Binder and Consultation! Thanks for your interest in our Introductory Elder Caring Wellness Consultation. Please complete and submit this form. After you submit your order form you will be asked to make your payment through PayPal. Credit cards accepted. You do not have to have a PayPal account.